Is some tall gringo standing cluelessly in the way of your moped? It may be Kevin or Page. Hello there! Have you been to Cape Town? No? Let me tell you some things. First, wow. It is beautiful. I have been to a lot of places in my life, many of them Super Awesome. But to date Cape Town takes the cake as the most beautiful. It’s amazingly situated, in the lee of two huge, table-like mountains, on a small peninsula. Further south on the peninsula are charming seaside towns, more dramatic cliffs, and then finally, the Cape of Good Hope. Surrounding the city are the oldest wine-producing regions in the southern hemisphere. The wine country south and east of the city is stunningly beautiful, like a Napa or a Tuscany covered with oak trees, looking out to the sea. And man, is it producing. The wine I had in Cape Town was unfailingly good, with peppery, spicy whites, astoundingly good champagne (or “Méthode Cap Classique” if you like being bullied by the French wine lobby), and their own style of reds, brandies, and port. Cape Town single-handedly helped me rediscover Chardonnay, thanks to their delicate, no nonsense, oak-free stylings. And did I mention how cheap this world-class wine is? Even at a fancy restaurant, I was hard pressed to find a bottle of wine over $10. Most glasses were only a dollar or two, and the ZA idea of a pour is to the rim, please. Like, so full you spill it on yourself when you pick it up. On top of all of that, the city of Cape Town itself is pretty neat. It’s got a lot of cute museums, Art Deco buildings, old Dutch homes, and Cape Malay and Muslim neighborhoods. After a long spell in a less developed part of Africa, it was pretty shocking to come to a city whose roads are better maintained than they are in any I’ve seen in the U.S.; a fancy, walkable downtown and harborfront area; and basically a city center that feels as modern as anything you’ve seen in the West. We kept exclaiming to each other over little conveniences that felt huge: Sidewalks! Taxis with meters so you don’t have to haggle over the fare! 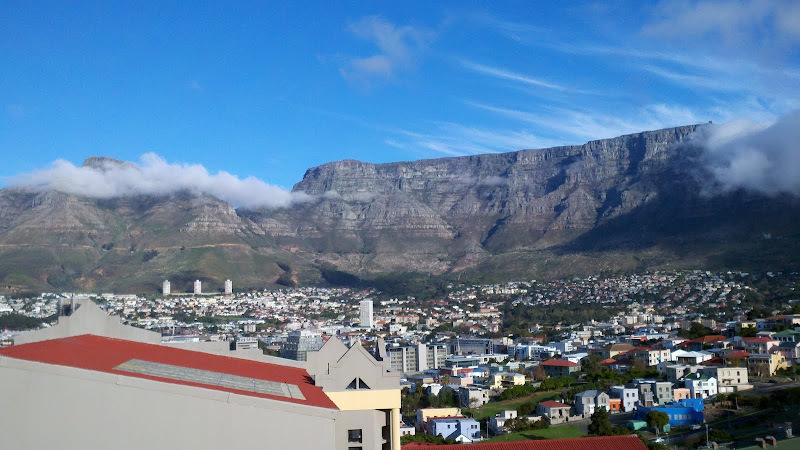 And after the pervasive dust of Nairobi, everything in Cape Town felt shockingly clean. Which is not to say ZA and Cape Town are without their problems. Apartheid is a very fresh memory and racism can still be felt everywhere; the tension that remains is uncomfortable. Neighborhoods remain starkly self-segregated by race — the legacy of apartheid means that black South Africans and South Africans of mixed race, who identify as “colored” and who enjoyed more privileges under the apartheid system, mostly choose not to live side by side. So there are black townships and colored townships, or segregated neighborhoods within the townships. And though the townships are VAST, housing millions of people, there seems to be a certain amount of willed blindness about them. Driving past one of the townships (a.k.a. slum areas), our white South African driver remarked a bit defensively that “they have DVD players and everything in there. They’re actually very comfortable.” Uh, OK bro. We had been warned that South Africa is mega-dangerous, though they also say that about Nairobi so we weren’t sure what to expect. Nothing bad befell us, but (Victoria’s mom, stop reading now!) we did have the most aggressive panhandling experience of our lives — a man chasing us asking for money and threatening to get his knife out, saying he didn’t want to mug us but he would if he had to. We were on a busy street and it was light out, and eventually we turned a busier corner and he gave up, but we were still shaken. And, presumably, that’s part of the reason the predominantly white areas are so gated and walled-in and coated with razor wire — but that feels weird too. On the flip side, we had cab drivers while were in Cape Town who were from Nigeria and Somalia, who spoke of Cape Town like a beacon of hope in the continent, an opportunity-rich, low-corruption zone where hard work is rewarded. So it’s a mixed bag, man. I don’t think a lot of it would have made sense to me without having actually visited. With all this said, the Cape is an amazing place to visit. You’re going to see a lot there. So come along with me, as I take you on my magic carpet matatu, to a photo journey through the Cape. Ride that Cape Town photo matatu here.